NMW is a Melee Captain Falcon player from Northern California. 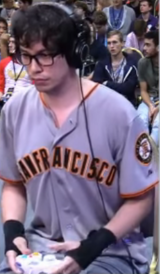 He is currently ranked 7th on the NorCal Melee Power Rankings and 83rd on the 2018 MPGR. NMW is well known for his doubles gameplay as well as creating a beginners guide for doubles. He is a former WarCraft III professional and went by the screen name "Shriek". This page was last edited on March 28, 2019, at 00:29.